A joint meeting on “Let’s work together and Global collaboration” with Christine Mackenzie, President-elect IFLA, Executive Committee INELI-Oceania and ALIA Fellow, Bangladesh Library Professionals and The Librarian Times (TLT) was held during 12:30-1:00 pm on August 26, 2018, at IFLA secretariat press room in Kuala Lumpur Convention Centre, Malaysia. 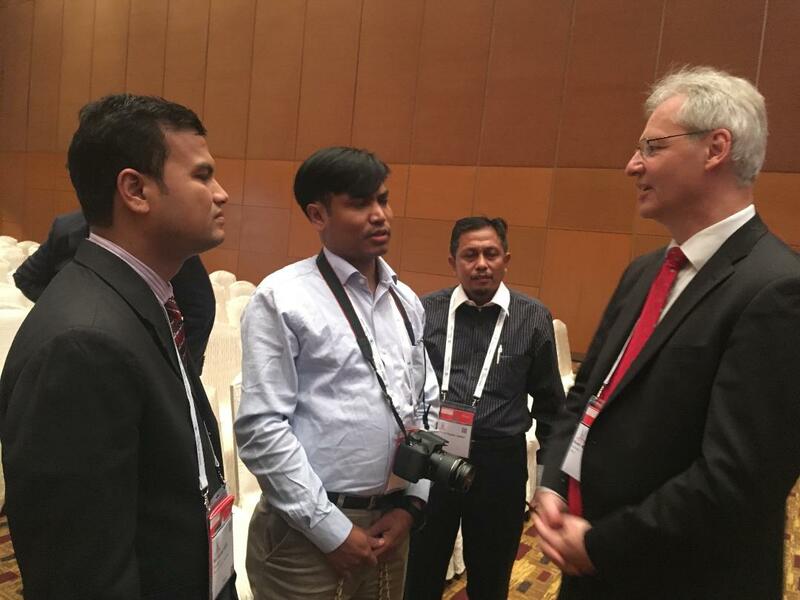 The joint meeting of the IFLA, The Librarian Times and Library Professionals Bangladesh addressed a variety of issues, most of which tied back to global collaboration and professional development. 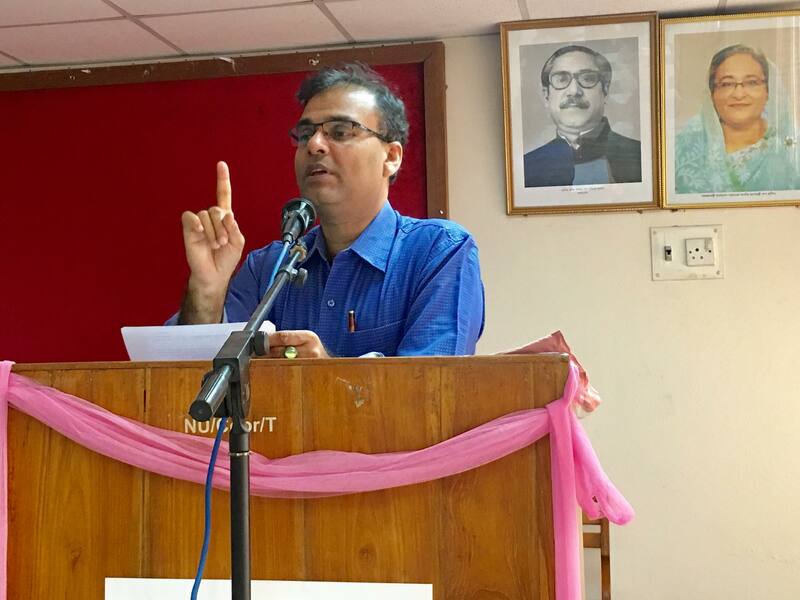 The session started with the welcome speech by Prodip Kumer Roy Editor-in-Chief of The Librarian Times.“Collaboration is fundamental to achieve any long-term professional goal” Mr Roy mentioned in his speech. After that, each of the participants introduced themselves. Professor Dr Nasiruddin Mitul, Dean, National University, Bangladesh started his speech by providing the present scenario of Library profession of Bangladesh. In his speech, Dr Mitul highlighted the importance of Global collaboration with IFLA for the advancement of Library profession of Bangladesh. He seeks potential help to organise joint professional training, service showcasing and other professional events to foster the professional activities in Bangladesh. Dr Dilara Begum, Associate Professor and head, Department of Information Studies and Library Management, East West University Bangladesh spoke briefly on the overall scenario and future prospect of the Library profession and professionals of Bangladesh. 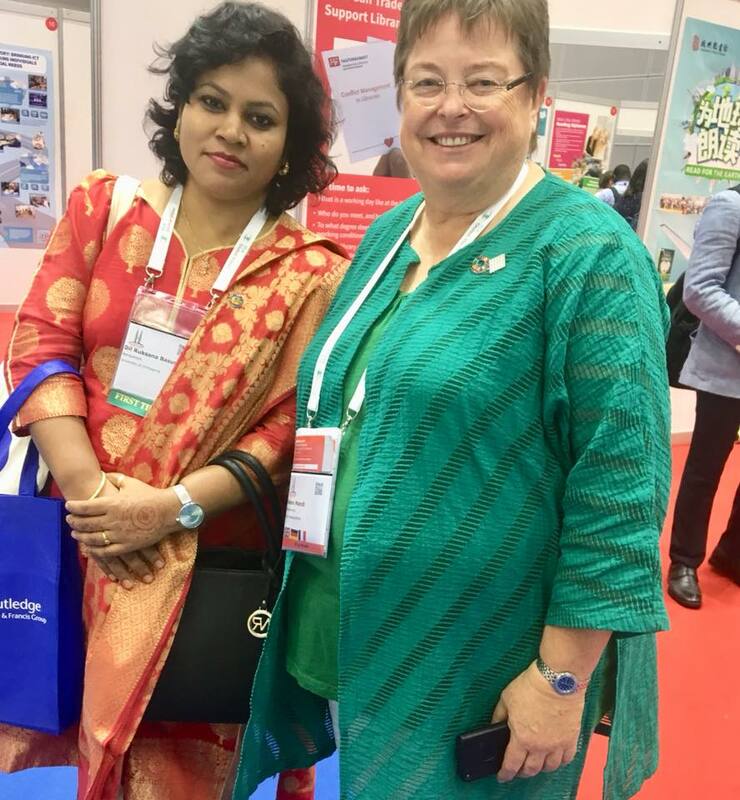 She mentioned about her engagement and activities with IFLA and other Global-Regional professional bodies that has given a good impression to the IFLA president about the capacity and professional competency of Library professionals of Bangladesh. Ms Razina Akther, Head of the Library, Bangladesh Shishu Academy also delivered a short speech emphasizing the inclusion of Bengali Language as the 8th language in IFLA’s official language list since Bengali is the 8th most speaking language in the world. She urges the IFLA president’s support and initiatives regarding the issue. 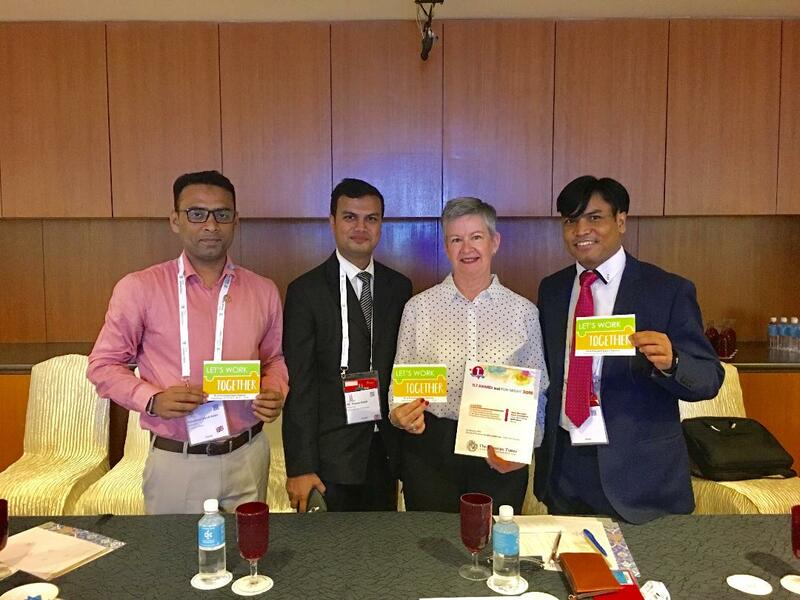 Christine Mackenzie in her speech praises the presence of a good number of Bangladeshi LIS professionals in the IFLA WLIC 2018. She termed it as a remarkable participation from the Country like Bangladesh. Ms Mackenzie urges the attendees for getting membership of IFLA in individual, institutional and organizational level as it is requisite to get collaboration, training and funding support from the highest LIS professional advocating body in the world. She hailed about the communication skills of the participants and expressed her gratitude towards the future prospect of the Profession of Bangladesh. The President hoped to provide support for the betterment in advancing of LIS profession of Bangladesh from her end. Her unique message to the greater library professionals was “Let’s work together”. She wishes to visit Bangladesh in attending professional events in the near future. INELI-Oceania and ALIA Fellow, Lyndall Ley Osborne, President, Australian Library and Information Association (ALIA), was also scheduled to attend the meeting. Unfortunately, she was unable to join due to an unavoidable circumstances. 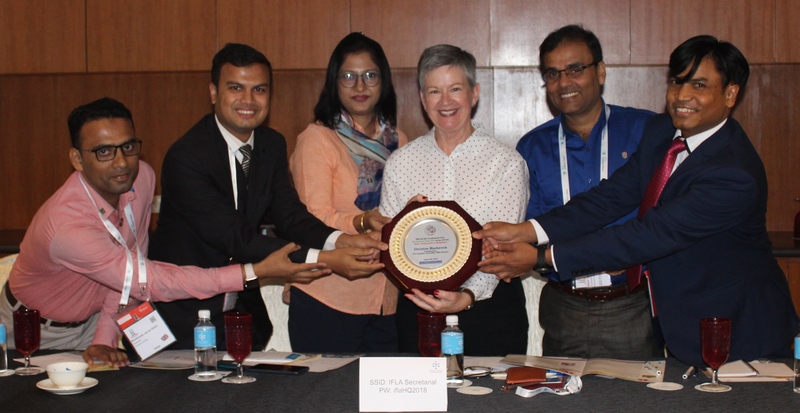 The meeting was ended by handing over a crest to Christine Mackenzie, President-Elect, IFLA from TLT editorial board along with the Library professionals of Bangladesh. Dr Dilara Begum, Associate Professor and Chairperson, Department of Information Studies and Library Management & Librarian (In-charge), East West University, Dhaka, Bangladesh. Dr Nasiruddin Mitul, Dean, National University and Professor Dept. of Library and Information Science, National University Bangladesh. Mr Dil Ruksana Basunia, University of Chittagong. 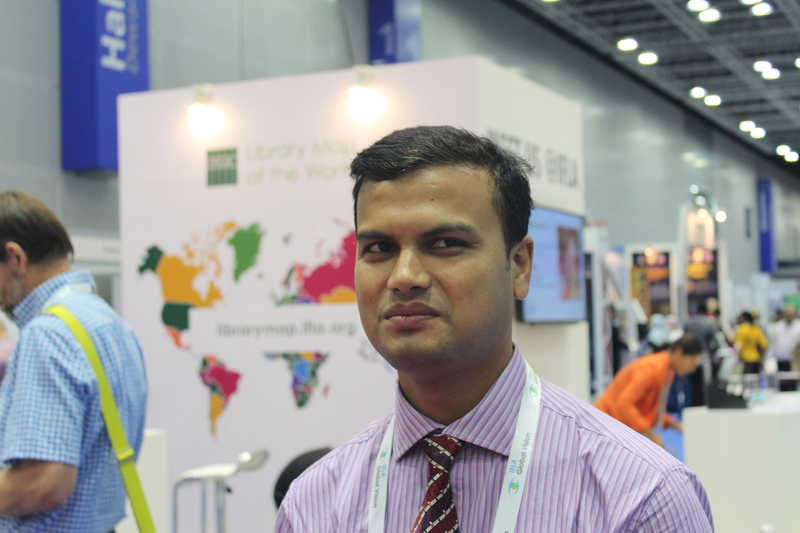 Mr Md Ahasan Habib, Library Officer, Islamic University of Technology (IUT), Gazipur and Associated Editor, TLT. Mr Mohammad Joynal Abdin, Senior Lab Instructor, Department of Information Science and Library Management, University of Dhaka and Member, TLT Editorial Board. Prodip Roy AALIA (DCP) Library Officer (Digital Collections) Copyright, Digitisation and Repositories, RMIT University Library, Editor-in-Chief of The Librarian Times. To commemorate the session, a group photo session was held at end of the programme. All participants were highly pleased to join this new milestone and historic meeting with IFLA president. Mr Md. Ahasan Habib has received Infoshare award 2018. The Special interest group for international information issues (SIG/III) is an interest group focusing on international information issues will sponsor him ASIS&T (Association for Information Science and Technology) membership. Mr Ahasan is Library Officer of the Islamic University of Technology (IUT). He is engaged as the Finance Secretary of Bangladesh Association of Librarians, Information Scientists and Documentalists (BALID) Executive Council 2018-19. He is also an Associate Editor of the Librarian Times (TLT). ASIS & T members—thousands of researchers, developers, practitioners, students, and professors in the field of information science and technology from 50 countries around the world—have made ASIS&T an important part of their professional development. As deserving award winner of ASIST & T, we believe that Mr Ahasan will work a fantastic way to enlighten for Library Professionals of Bangladesh. Warm and hearty congratulations to Mr Ahasan Habib on his fantastic achievement. TLT family is feeling proud of him. Thank you for registering for the event Bangladesh High Commission Reception. This event is being held on Monday, 27/08/2018 at 3:30 pm at Bangladeshi High Commission office in Kuala Lumpur. The Bangladesh High Commission office has invited the Congress delegates to attend a reception at the Bangladesh High Commission Malaysia. Bangladeshi Delegates are requested in joining the meeting on time. 54100 Kuala Lumpur, Wilayah Persekutuan, Malaysia. 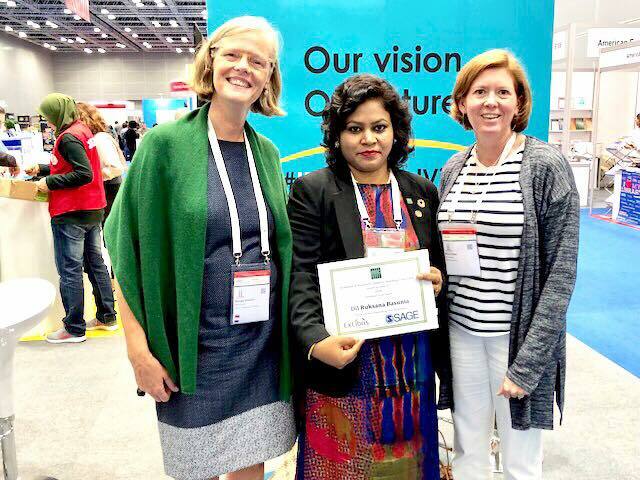 Dil Ruksana Basunia, Corresponding Member of the Standing Committee, RSCAO, IFLA and Deputy Librarian, University of Chittagong, Bangladesh is attending the 84 IFLA Annual Congress from 23 to 30 August 2018 in Kuala Lumpur, Malaysia. She is one of the grand winners of IFLA, ARL awards to attend the Congress. During the Congress, she has attended many Special sessions including the Congress Programme, Business Meetings, and Expo Pavilion/Tech Lab Session etc. Earlier, Dil Ruksana attended an International Conference named “Diversity of Data: RDA in the international context” at University of Technology Malaysia (UTM) was held on 23 August from 8:30 am to 4:30 pm. She met with the international Library professionals mainly from Malaysia, Australia, New Zealand and many other regions. She had some discussions with the Library of Congress staff regarding RDA and impact of RDA in Bangladesh Context. 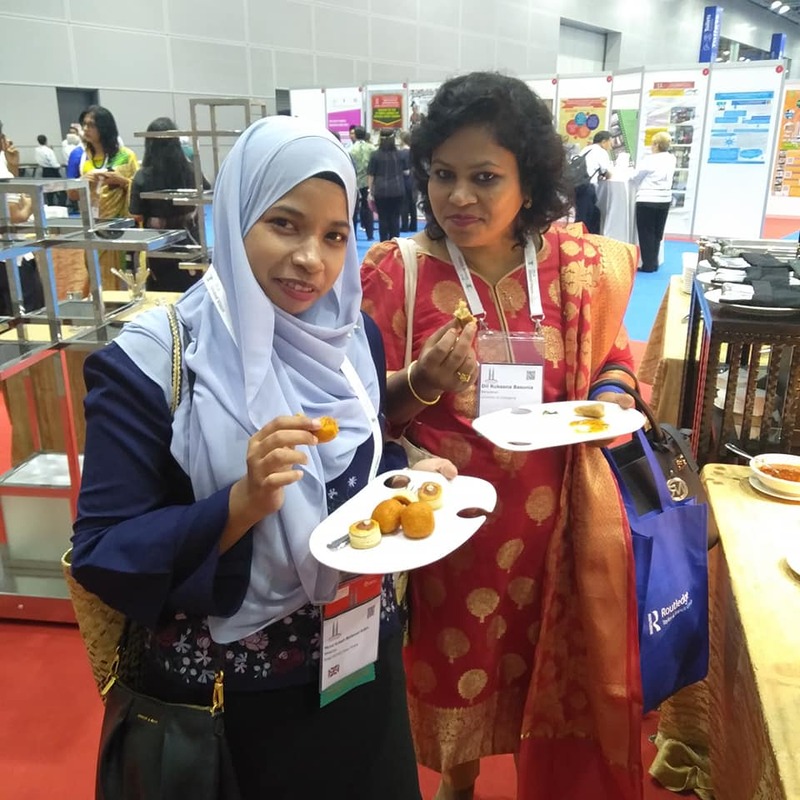 She also attended the Newcomer session of IFLA Congress and the Opening Ceremony where she found really productive about whole IFLA Congress and how to build networking with international colleagues and different forums. She was invited for the 2nd ASEAN Caucus Meeting and lunch on 25 August. Dil Ruksana RSCAO, IFLA standing Committee meeting as a member of the committee. Many library issues were discussed including library development in Bangladesh. 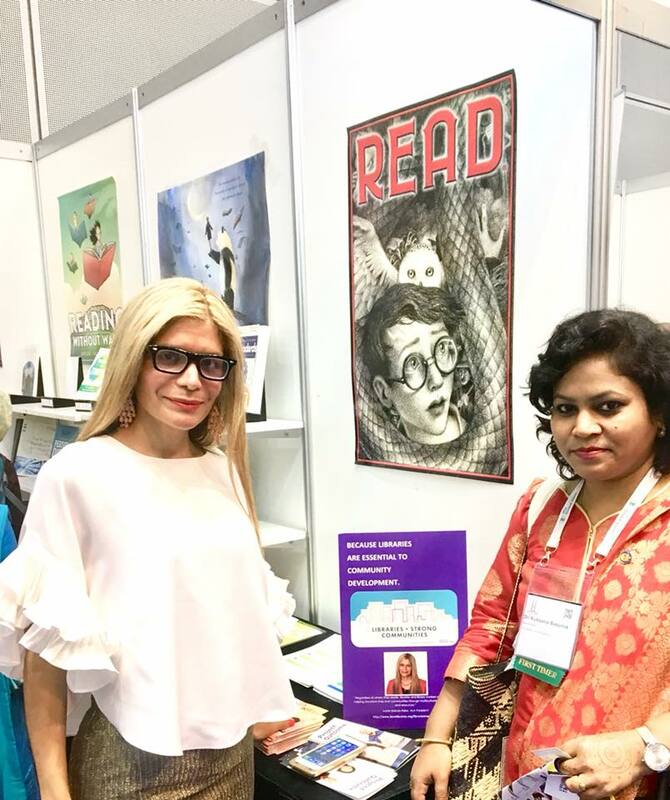 She attended the Exhibition Opening Party where she met ALA president, OCLC staff and other publishers from all over the world. She had also dinner invitations from IFLA , ARL, OCLC and other professionals. She will be attending the ‘Award Presentation’ as the Grant Winner of ARL 2018. In the next few days of IFLA Congress, she has a number of plans to attend open sessions, SC meetings, Professional Meetings, Cultural Evenings, President’s session, IFLA highlights, Global Vision, International Advocacy Program, Plenary Sessions, Poster Sessions, Lightning Talks and the Closing session. 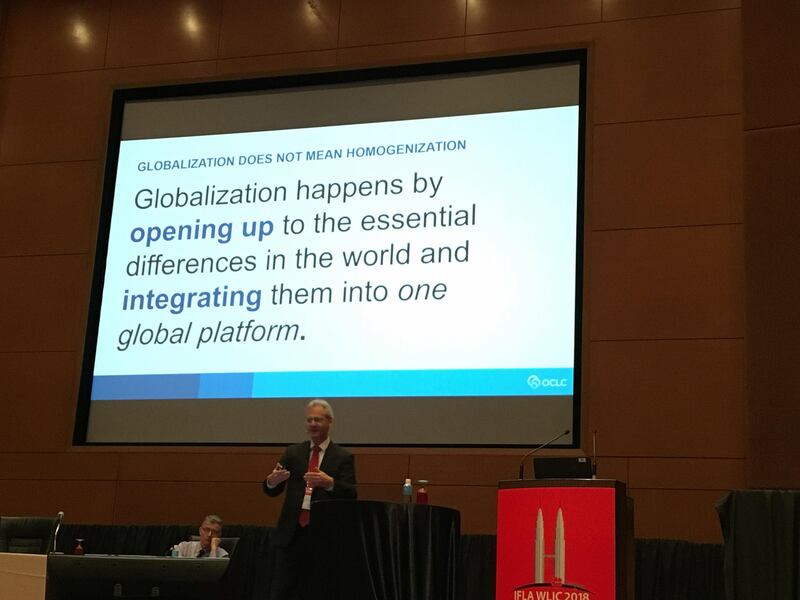 Now, more than ever, libraries around the world are able to collaborate across national borders while simultaneously satisfying regional and local requirements. At the Symposium, speakers presented about original research that explores the shared challenges, opportunities, and trends in this area. Discusses how technologies and resources like WorldCat can power collaboration across regional and global ecosystems, generating greater network efficiencies and providing a more complete view of the world’s collected knowledge. The presenter of this multiple sessions also shared some case studies and examples of OCLC’s latest innovations. A three-member delegation from TLT editorial board led by the Editor-in-Chief, Prodip Kumar Roy attended the OCLC Industry Symposium on Saturday, 25 August, 13.45 – 15.45 local time, in Conference Hall 3 at Kuala Lumpur Convention Center (KLCC), Malaysia. The symposium was organised as part of the OCLC’s contribution to IFLA World Library and Information Congress 2018. Speakers of the session include Lorcan Dempsey, Vice President, Membership and Research, Chief Strategist, OCLC, Eric van Lubeek, Vice President, Managing Director, OCLC EMEA and APAC, Axel Kaschte, Product Strategy Director, OCLC EMEA. At end of the symposium, TLT board met with Axel Kaschte, Product Strategy Director, OCLC EMEA and discuss the potentiality of organising international events and showcasing on different products and services of OCLC with the collaboration of TLT, LIS education institutions and Bangladeshi Library professionals’ body. He suggested preparing and submitting a proposal about potential events and possible collaboration between OCLC and TLT. Later on, TLT editorial team visited Stand B127 during exhibit hours on opening day of the exhibitions to meet with OCLC officials and learn what’s new with OCLC services and initiatives. Besides TLT team, a number of Bangladeshi delegates including Professor Dr Nasiruddin Mitul, Mohammad Shakaought Hossain Bhuiyan, Bepin Behary Karmakar was among others participated in the session. 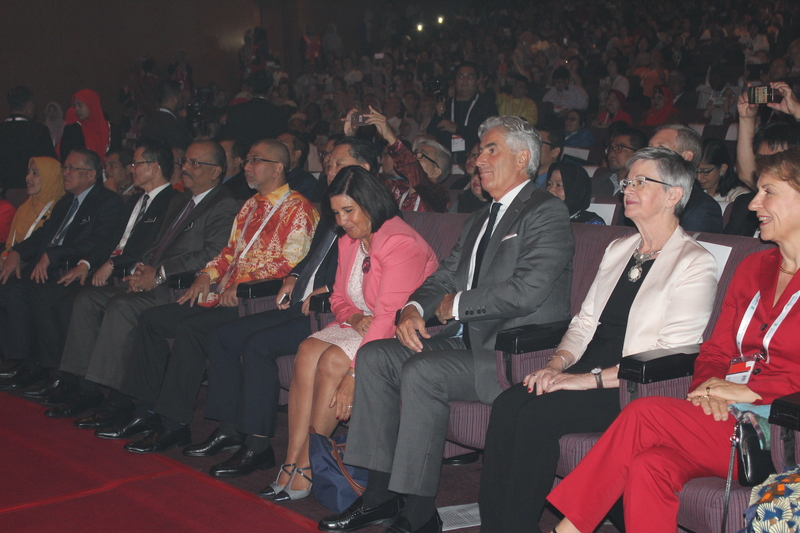 Congress delegates attended the opening ceremony of the IFLA WLIC 2018 together on Saturday, 25 August 2018. The main theme of the official Opening Ceremony will reflect the main Congress theme: Transform Libraries, Transform Societies. 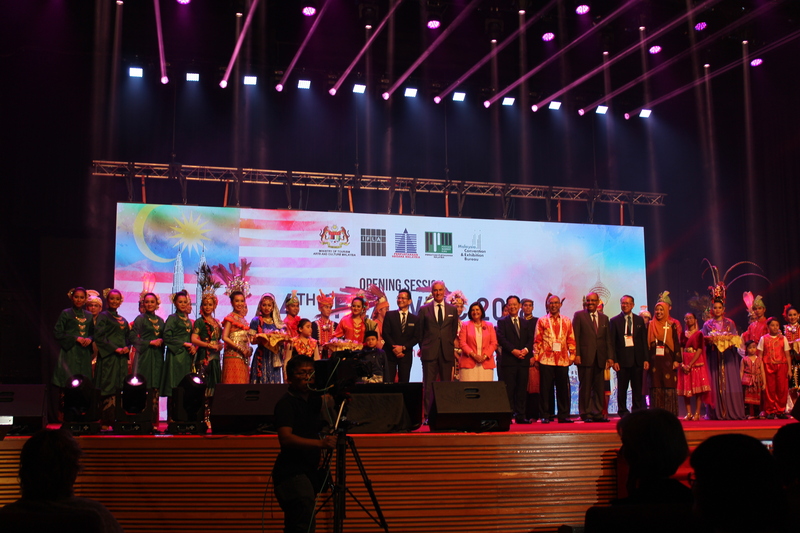 The library world global spotlight will shine on Malaysia in August this year when Kuala Lumpur hosts the 84th World Library and Information Congress. 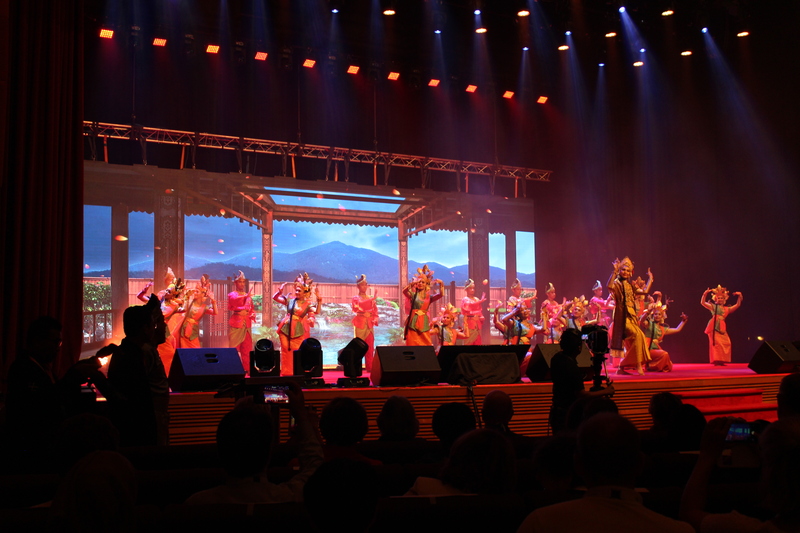 The Congress organized by the International Federation of Library Associations and Institutions (IFLA), Librarians Association of Malaysia, and the National Library of Malaysia, with the support of the Ministry of Tourism, Arts and Culture Malaysia, and the Malaysian Convention & Exhibition Bureau, will be held from 24-30 August 2018 at the Kuala Lumpur Malaysia. This annual IFLA brand flagship professional event is the world’s most significant and identifiable gathering and the most exciting event of library and informational professionals. It is the first time in the history of IFLA that the Congress is being held in Malaysia. In 2016 it was hosted by USA, in 2017 by Poland and it will be held in Greece in 2019. The Congress will provide an unparalleled opportunity, in a multi-racial and multi-cultural environment to the professional development of its participants. The global aspect of the Congress program also provides excellent networking opportunities for those who attend. More than 3,000 participants from 102 countries have so far registered for the Conference. Two hundred and forty-nine sessions with over 600 paper presentations will allow participants to discuss, debate and exchange ideas on professional issues related to every aspect of the library profession. Leading edge initiatives will be presented and experts in all areas of library and information science will be present. In line with the theme of the Congress “Transform Libraries, Transform Societies”, there will be, among other topics, presentations that address the role of libraries in delivering the UN 2030 Agenda, Designing inclusive and sustainable libraries, the use of video games to develop wining strategies for libraries, the use of new technologies such as artificial intelligence, machine learning, and augmented reality, and digital scholarship services. There will be 121 poster presentations from all over the world on diverse topics such as The whole school reading for half an hour (China), Role of NGOs in library development (Bangladesh), and Makerspace at the library (Sweden). A trade exhibition will be held during the Congress where more than 60 commercial and non-commercial organizations from all over the world will showcase their products and services. Library visits to 33 Malaysian libraries will be arranged to allow participants to visit the National Library of Malaysia, academic libraries, special libraries, public and school libraries in the public, private and voluntary sector in Malaysia. These visits will allow participants to see the application and adaptation of innovative ideas to the services in these local libraries. Registration details, the Congress program and other events is available at http://2018.ifla.org. “In this age of information explosion, the importance of the library and information science is immense. 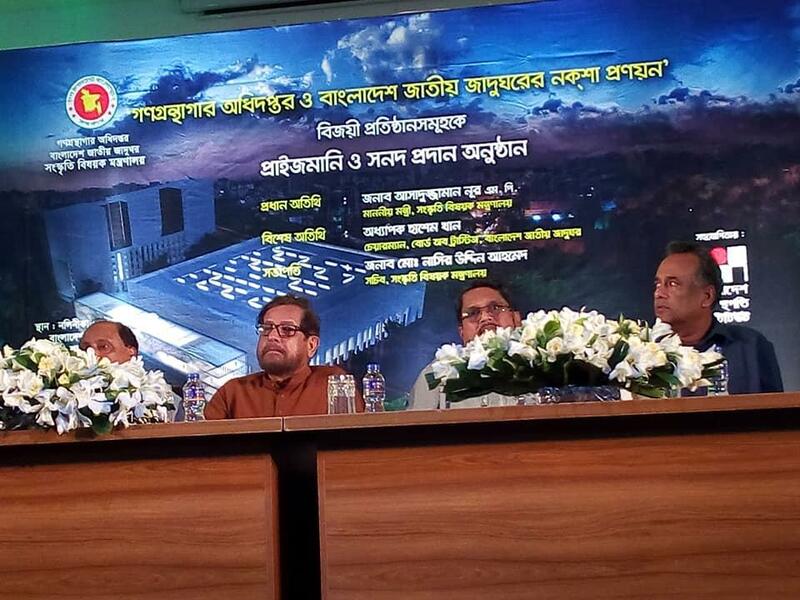 In this regard, the degree holders will be the real artisan to build the future of Digital Bangladesh. This educational program should be undertaken to build a digital Bangladesh with the mindset of the country. This special course will contribute to the needs of a large number of information scientists in the country” said, Professor Dr Nasiruddin Mitul (Dean and Program Coordinator of the Department of Higher Education) in the Library and Information Science orientation program held in National University (NU) on 12 August 2018. The program was organised for NU post-graduate diploma in library and information science students last Sunday at 11 am at Senate Hall of NU. 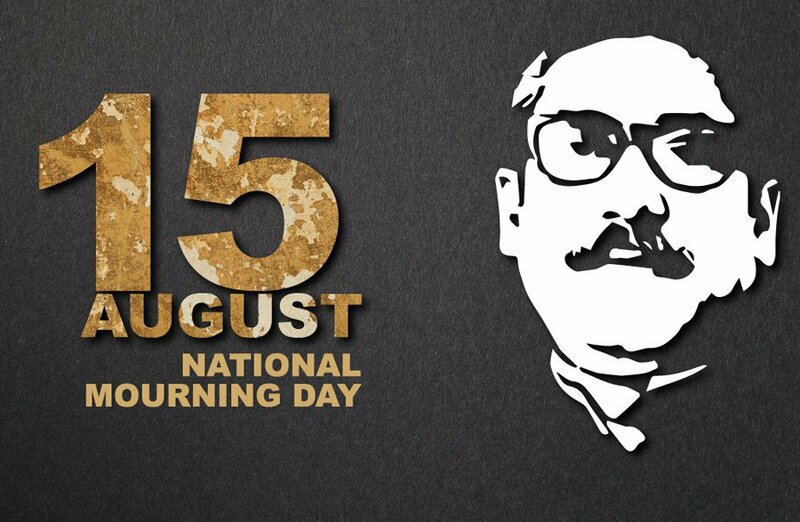 At the beginning of the ceremony, one-minute silence is observed for the forgiveness of the departed soul of Father of the Nation Bangabandhu Sheikh Mujibur Rahman on the occasion of the month of mourning. Students coming from the remote areas of the country are enrolled in the one-year professional course with a hope of building themselves as skilled people for developing the country. Dean of Curriculum of National University spoke among others at the ceremony. Mohammad Bin Kashem, Registrar; Mollah Mahfuz Al-Hossain, College Inspector; Dr Md. Moniruzzaman Shaheen and President of Social Science Group, Awlad Hossain also delivered their speech on the program. A large number of teachers, officers and employees were present at the event. 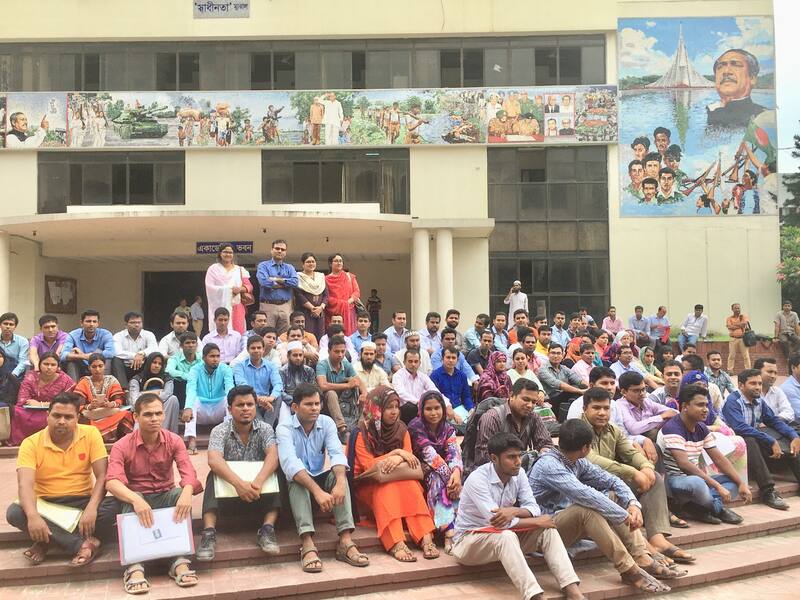 It is to be noted that in the 2016-2017 session, the postgraduate diploma in library and information science program was started with the semester system with 100 students at the National University Gazipur campus. Later, considering the demand of the wider, the number of seats was increased to 120. All information related to the admission can be found at the National University website www.nu.ac.bd. The National Mourning Day observed amid paying homage to the portrait of Father of the Nation Bangabandhu Sheikh Mujibur Rahman at Shawkat Osman Memorial Auditorium, Shahbag, Dhaka. The programme was organised jointly by Directorate of Public Libraries and Directorate of Film Publications. 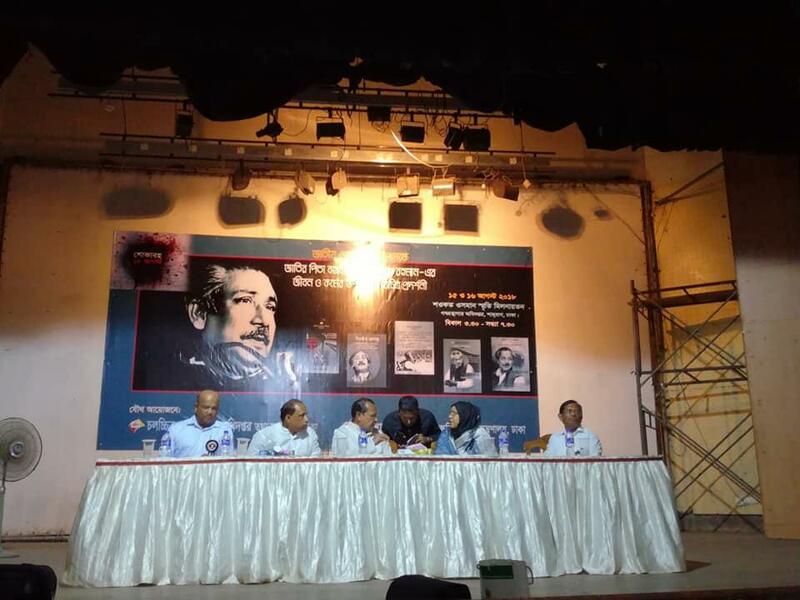 Documentary films on Father of the Nation Bangabandhu Sheikh Mujibur Rahman, his life and activities were screened. The programme was inaugurated by H.E. Hasanul Haq Innu, Minister, Ministry of Information, and Government of the People’s Republic of Bangladesh. Secretary, Ministry of Information, Director General, Directorate of Public Libraries and other high officials and staff members from both the organisations were present at the event. 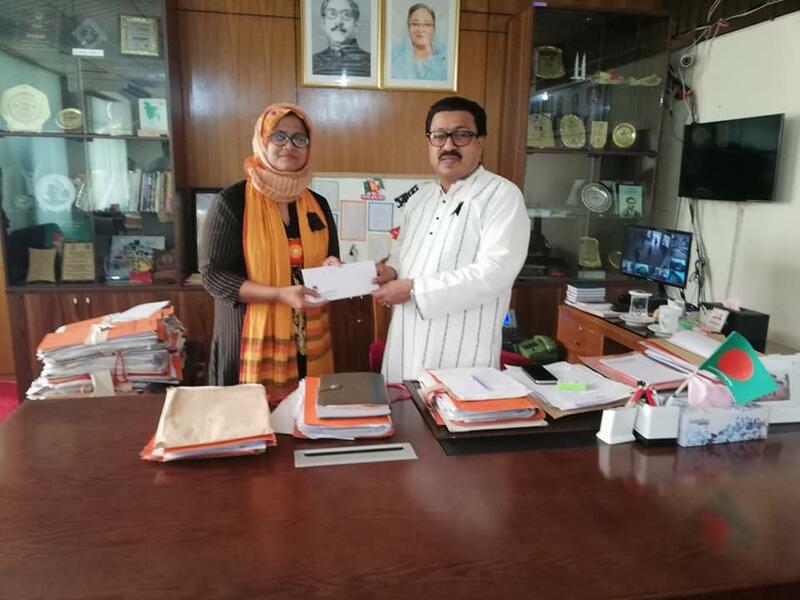 Ms Shamima Yesmin has been promoted to Assistant Professor at the Institute of Information Sciences, Noakhali Science and Technology University. Prior to joining to this university as a Lecturer, she worked for East West University. Ms Shamima earned her Bachelor and Master degree in Information Science and Library Management from the University of Dhaka and secured 1st position in her both examinations. She was also awarded Deans’ Award by Faculty of Arts, the University of Dhaka for her outstanding result. She has been invited to speak in international conference overseas and has published a good number of articles in top internationally-refereed journals and conference proceedings. TLT Congratulates Ms Shamima on receiving her deserved the promotion. For designing Directorate of Public Library and National Museum multi-storeyed building, the Ministry of Cultural Affairs organised a prize money and Certificate Award Session on 30 July 2018 at Nalini Kanto Bhattacharjo Gallery, National Museum, Shahbag, Dhaka. The Chief Guest of the Ceremony was H.E. Asaduzzaman Noor, MP honourable Minister, and Ministry of Cultural Affairs while Mr Md. Nasiruddin Ahmed, Secretary, Ministry of Cultural Affairs chaired the session. An inaugural speech was given by Mr Asish Kumar Sarkar, Director General (Additional Secretary) Directorate of Public Libraries. The programme was ended followed by cultural functions. Once a well-designed multi-storeyed building is built under the project, the public library will be shifted to it, adding that another multi-storeyed building will also be constructed for the National Museum. 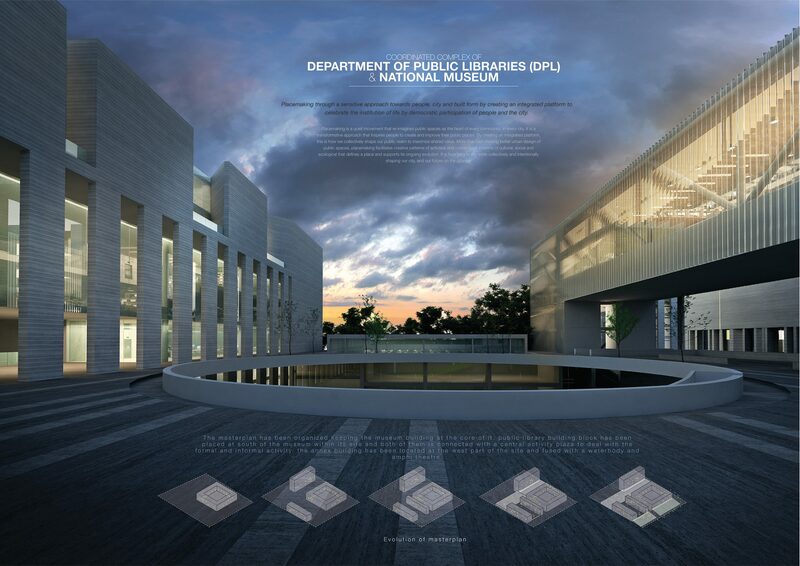 Cubeinside Design Ltd. in association with Dcon Design Studio won the first prize (As per their Facebook pages) on national design competition of coordinated complex of Department of Public Libraries (DPL) and Bangladesh National Museum. Placemaking is a quiet movement that re-imagines public spaces as the heart of every community, in every city. It is a transformative approach that inspires people to create and improve their public places. By creating an integrated platform, this is how we collectively shape our public realm to maximize shared value. More than just creating the better urban design of public spaces, placemaking facilitates creative patterns of activities and connections in terms of cultural, social and ecological that defines a place and supports its ongoing evolution. It is how people are more collectively and intentionally shaping our city and our future on the country. The main goal of the design is to create a place that has both a strong sense of community and a comfortable image for all aged people, as well as a setting, activities and uses that collectively add up to something more than the sum of its often simple parts by celebrating the institution of life by democratic participation of the entire city.